For best results, listen to tracks with headphones or while you sleep. 3 powerful tracks, each designed to enhance the mind and body in different ways. 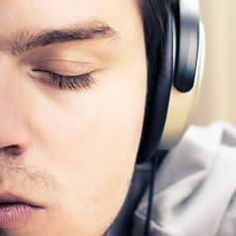 Binaural frequencies take your mind to deeper levels of relaxation for a wide range of benefits. Designed using the latest, research-based technology for powerful results guaranteed! How can just listening to sounds produce these effects? The human brain has the tendency to synchronize with external frequencies is a well known phenomenon in neural research, it’s called the frequency following response (FFR). An external frequency firing in a sense modality of sound or light in the ranges of the brain’s normal conscious operations (4Hz-20Hz) causes our neurons to begin synchronizing with the external frequency. If the frequencies are “ramped” or slowly change from normal to deeper levels of consciousness, the brain follows this movement even more readily. Essentially, the brain operates with a predominance of beta (13-40Hz) when we’re mentally active, 7-12 Hz when we are relaxed and at theta (4-7 Hz) and delta (0.5-4 Hz) levels during deep sleep cycles. 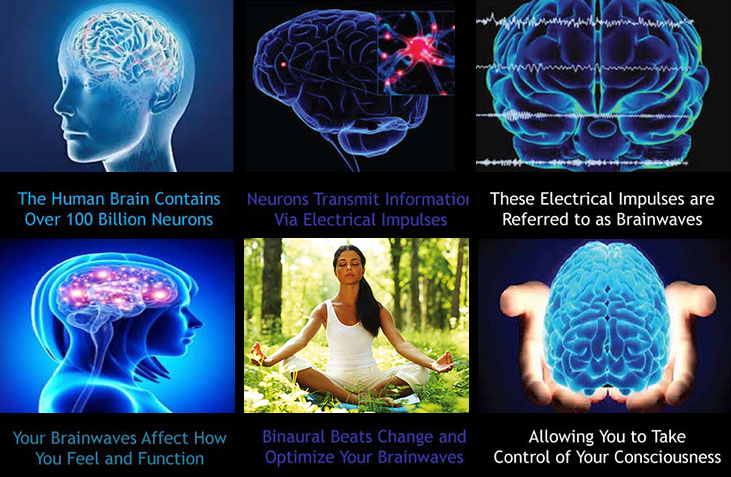 There are many exciting studies on using these frequencies and the ability for them to be induced for everything from ADHD, pain control, mood disorders and chemical dependencies. Use the entire set as an aid to reach deeper levels of meditation, healing and spiritual connection. The Submersion: Brain Reset track is excellent for a quick body/mind recharge or power nap. The Theta-Wave Induction: Deep Relaxation is used as a fast frequency-based espresso for the brain. Use Delta-Wave Gateway: Astral Plane as a fast-track to the powerful super learning and healing delta brainwave state. Activate both sides of the brain. Binaural beat layers actually force both sides of the brain to cooperate to synthesize the sound. More creativity, calmness and focused mental state. More clarity and mental energy to get things done! Tour places of rich imagery and imagination. Experience states achieved by life-long and dedicated meditation. Your brain is taken through a rich spectrum of states to help counteract the routine grooves of day to day stimuli. Works great with Supreme Iridium! Please see our minerals section. *Never listen while driving or while operating any machinery. **These statements are not to be construed as medical advice and have not been evaluated by the FDA. ***Do not use if your are prone to seizures, under 18, or pregnant. I have been able to think clearer and stay focus. I really like to play them when I’m in the house relaxing. I also play during meditation. My children listens to them as well. Since listening my son is even more focused in school. He struggled being able to stay focus in class, and comprehend. Love all products purchased. I'm usually the one who would go on you tube to find free binaural beats, but after listening and learning about HPU I've decided to invest for the first time. So glad I did!!! The frequencies are amazing and the theta waves had the right side if my brain vibrating.. Thank you HPU! I took a chance.. Glad I did! I am a very skeptical person, so when I saw Naazir's videos I thought it was a lot of fluff. However, when I visited the website and saw all the positive testimonials and the money back guarantee, I decided what the heck, give it a try! WOW! WOW! I am sooo glad I did. I strongly recommend this program. I'm a bit of a skeptic. I sometimes scrutinized and nitpick. And this product was no exception I had some doubts. But I had a goal in mind to stay focused on not smoking as heavy, for a female it's very unattractive and simply bad for anyone's health and I knew this but I felt addicted to cigarettes and marijuana. I wasn't about getting no patch or pills. So when I read about the benefits of this particular meditation I told myself to give it a try. Now I've been a smoker for many years without a break I depended on it to sleep, eat and cigarettes to fill the gaps. After couple days of meditation; I don't smoke anymore! The cravings, the urge, the excuses, the thought process all gone and it had a lot more benefits as well I would definitely recommend it. Naazir is a man of his words! These wave tracks there is no words for it but I love them! I wasn't sure if it would work for me but I bought it anyway. (Glad I did) It's made me really smart, I usually have problems with memory and comprehension and with this it made me smarter after a week of using it. I started to notice my memory getting sharper and being able to understand things faster. I'm also more focused on everything that I do. This Mind Tonic really works! Mind Tonic does just as it says. It is really powerful and will unlock levels of power in your mind's eye. I personally know this for a fact! I could say more but you need to personally try this super great brain program for yourself!! You well feel great, that I can promise you.